Chanmyay Myaing Sayadaw was born on October 5 in 1952 in Upper Burma. As a young man he came to the local monastery to become a novice. Later he went to the famous Mahagandhayon monastery in Amarapura where his older brother was. In 1972 he was ordained by Mahagandhayon Sayadaw. He studied the Buddhist scriptures and finally took and passed the Dhammacariya-Exam. After that he taught the Buddhist scriptures for ten years. In 1976 he practiced Vipassana meditation in the Mahasi Meditation Centre in Mandalay where he was taught by Chanmyay Sayadaw. Some years later he went to the Chanmyay Yeiktha Meditation Centre in Yangon, where he was commissioned to teach meditation. 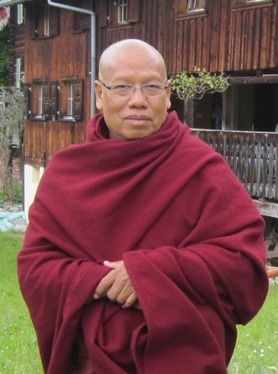 In 1996 Chanmyay Sayadaw sent him as a teacher and abbot to the new Chanmyay Yeiktha Meditation centre in Hmawbi. Since 2004 he lives in his meditation centre at the outskirts of Yangon and in 2009 he established a centre in the Shan-Hills near the town of Pyin Oo Lwin.